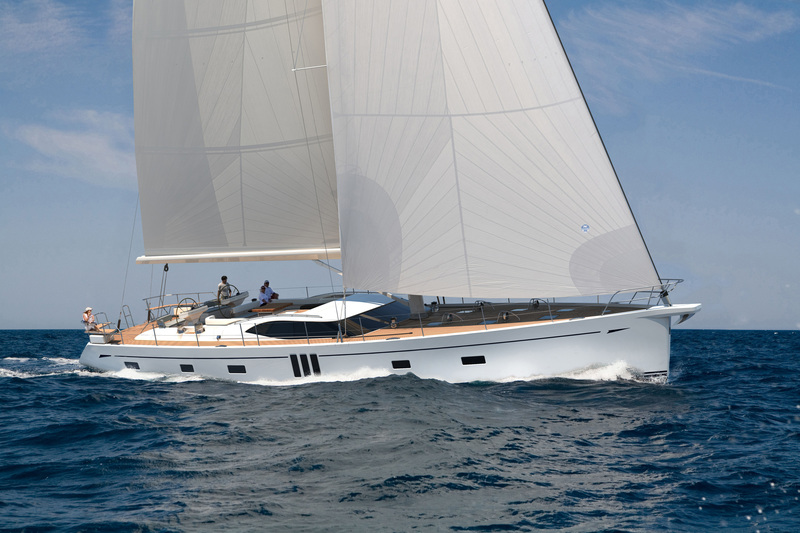 For more than four decades the Amel has built long-range cruising yachts that have a loyal and enthusiastic following. 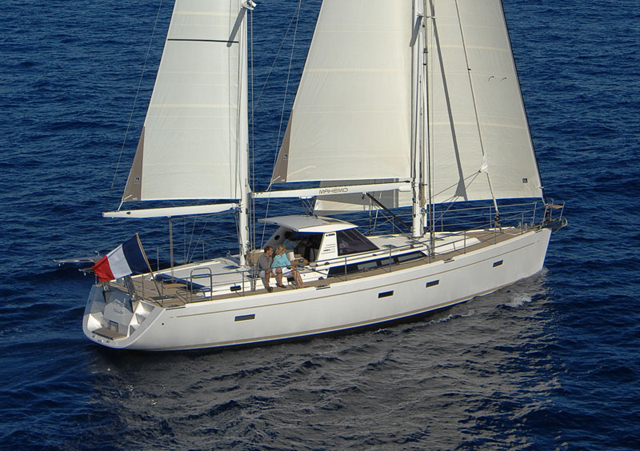 The yard was founded in La Rochelle in 1968 by Henri Amel, a knowledgeable sailor and seaman who was enthusiastic about producing refined and reliable serious cruising yachts that could easily be handled by a couple and that were also easy to maintain. The most striking feature on deck is the wheel shelter at the forward end of the cockpit - photo J M Rieupeyrout. 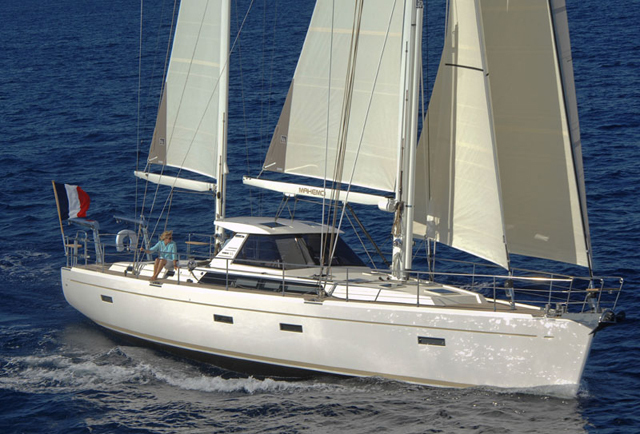 As a result, a number of defining characteristics can be seen in every model the yard has produced – all have sheltered steering positions, watertight collision bulkheads, cutter headed ketch rigs, a single skin fitting for all water inlets, for instance. There's also a solid rail around the deck, instead of guard wires, and no external woodwork. The latter significantly reduces the time and cost of annual maintenance, as well as avoiding the cost of replacing or overhauling teak decks at intervals. The marque is also well-known for fitting a high level of equipment as standard, ensuring that it’s of the highest quality and installed such that everything is easy to service and repair. Below the waterline, rudders are supported by a full-length skeg and the propeller, which is on the trailing edge of the keel, enjoys good protection while also eliminating issues with prop shaft alignment. 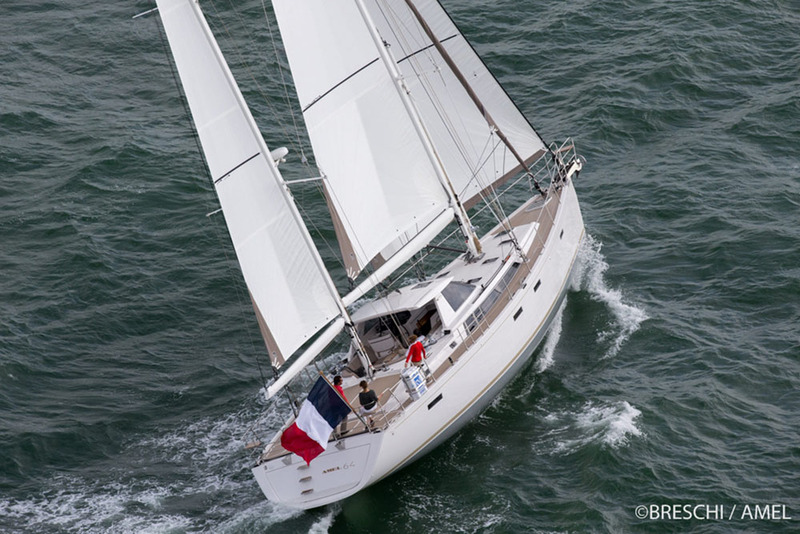 Since Amel’s death, while the yard has broadly kept firmly to its founding principles, some rules have relaxed and the design of new models passed to the partnership of Jean Berret and Oliver Pacoupeau. The cutter headed ketch rig is fully furling, with electric reefing on the mainsail and genoa - photo J M Rieupeyrout. The most striking feature on deck is the wheel shelter at the forward end of the cockpit, which provides excellent protection from both excessive sun and inclement weather, while providing a good view from the leather upholstered helmsman's seat. Opening hatches both overhead and in forward and side windows provide ample ventilation when necessary. Further aft there is also ample space for sunbathing and relaxing in the open. 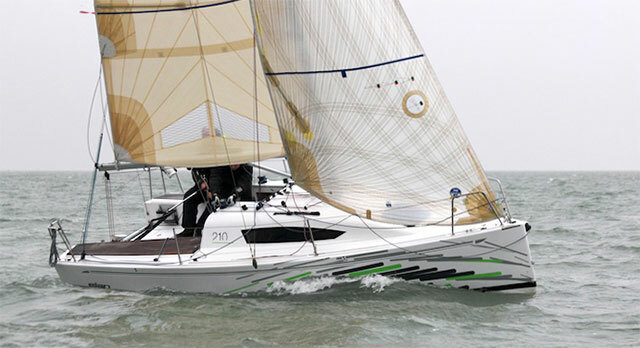 Hefty displacement, combined with a moderate hull shape, promises a comfortable motion at sea, while a long waterline length gives good speed potential. The cutter headed ketch rig is fully furling, with electric reefing on the mainsail and genoa and a full set of electric sheet winches. Anchoring arrangements are an excellent illustration of best practice for extended voyaging, with double bow rollers allowing two anchors to be carried on bow ready for use and enough room in the chain locker for an optional second electric windlass to be fitted. For ease of communication, there’s direct line of sight from the sheltered steering position to the navigation station below - photo J M Rieupeyrout. 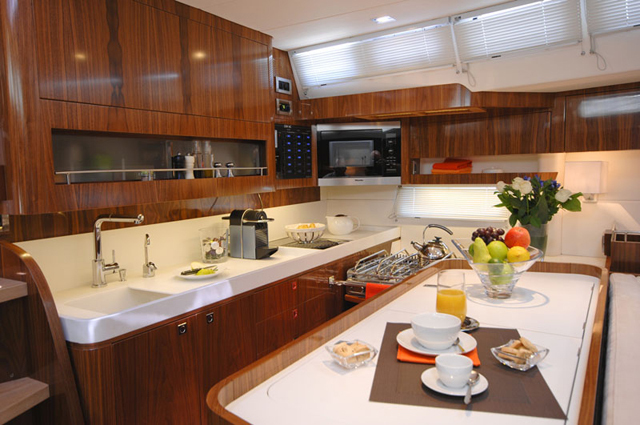 In common with other Amels, for ease of communication, there’s direct line of sight from the sheltered steering position to the navigation station below and from there to the large galley opposite. This is open-plan, effectively within the saloon, rather than being tucked away down a passageway and is very well appointed, with extensive worktop space, excellent stowage including a large well insulated fridge and freezer. 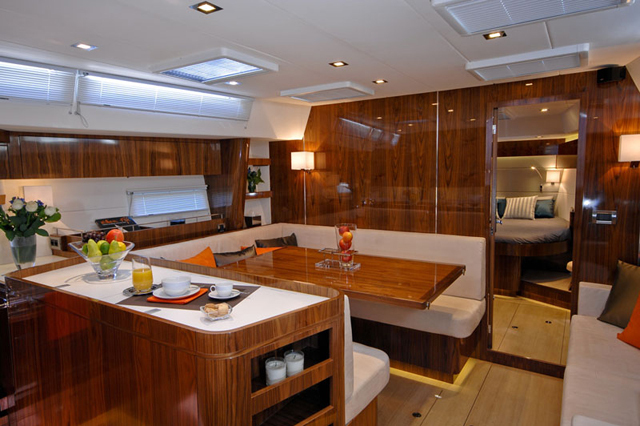 The saloon has a huge table with wrap-around seating to port, with hull ports and large coachroof windows providing plenty of natural light and ventilation and making the interior as bright as those of her competitors. Unlike many boats of this size, hand holds are plentiful, so moving around safely should pose no problem even in the most severe of conditions. The deep bilge throughout the boat is designed to stay dry, which makes it excellent for further stowage. The sizable galley - photo J M Rieupeyrout. Forward is a big en suite stateroom, with hull windows that give a lovely view out on each side of the peninsula bed. There's excellent headroom, lots of stowage, and a dressing table with its own seat. Two alternatives are available for the after quarters – a huge owner's stateroom, even larger than the forecabin, or a pair of cabins with either side-by-side twin beds or a huge double. With both versions there's also a berth in the passage next to the engine room. As well as the fully water tight forward and aft bulkheads, the main bulkhead, between the saloon and forecabin is semi-watertight, with rubber seals on the door and a strongback to close it firmly. The aft cabin(s) are similarly sealed, and the engine room is in its own a watertight compartment. The combined effect is a much greater likelihood of staying afloat following a breach in any single area of the hull. The saloon and galley are open plan, with plenty of natural light - photo J M Riepeyrout. Amels have always come with a very high standard of equipment, with almost all requirements already taken care of, including even a three-cylinder diesel 240V generator and a washer-drier. 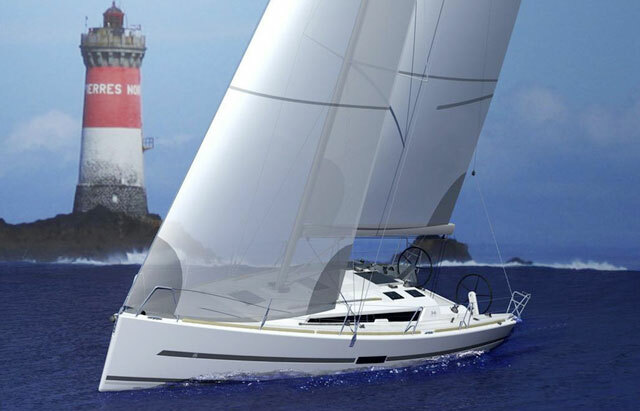 As a result the options list is restricted items such as a retractable stern thruster – the bow thruster is part of the standard equipment – and a larger 140hp engine in place of the standard 110hp unit. 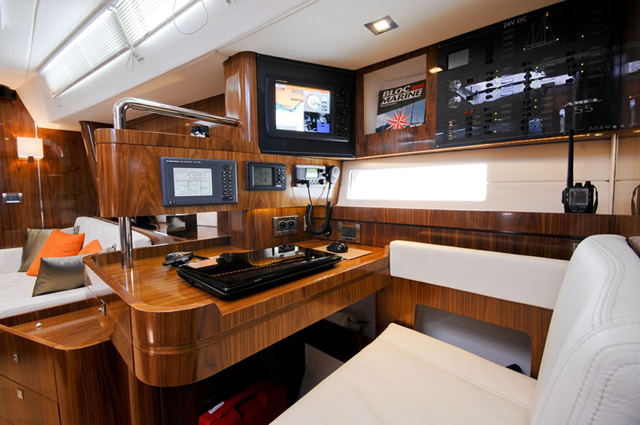 The interior may feel a little smaller than some boats of a similar size, but very few can rival this boat either for stowage space or for the many innovative features that other manufacturers have often been slow to emulate. 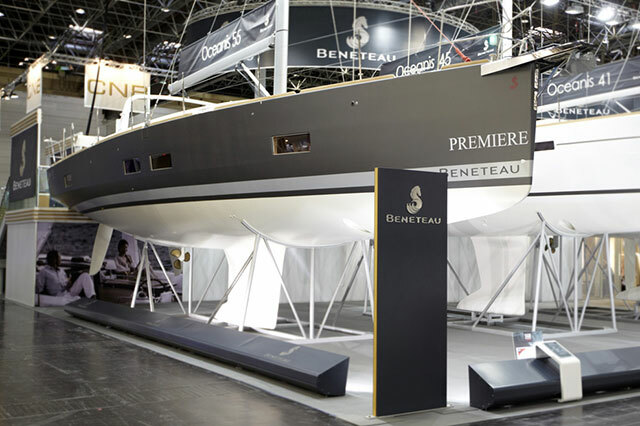 These are boats that are borne of a powerful blend of knowledge, experience and an uncompromising attitude. 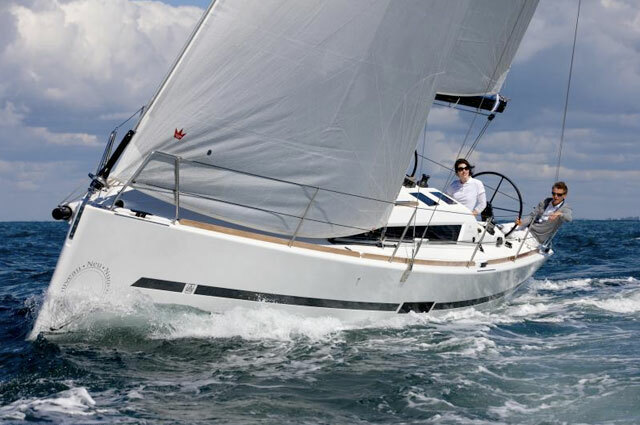 Each boat is supplied in voyage ready condition, and includes a seven-day handover period that gives owners time to become properly acquainted with the vessel’s systems. 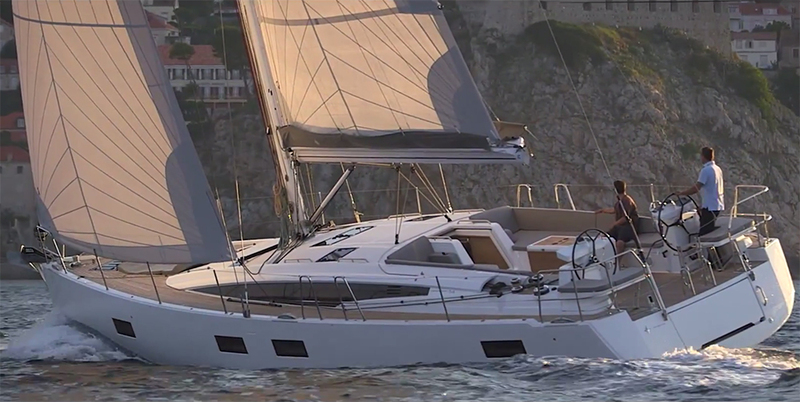 With its blend of easy handling and easy maintenance, plus comfort and space this boat is one that should certainly be considered by anyone planning long-term cruising. For more information see Amel.